The last few weeks have been jam packed with so much activitiy I can hardly think of where to start!. There had been visits from family and demonstrations given as well as trips to Sydney for seminars and workshops as well as the regular attendance in class to continue my own leaning and ikebana journey. And to make things a little more crazy I've also been struggling with a bit of a chest infection. So you can see the title of this blog entry is very apt. Lets start by looking back a little, with the family visiting I wanted to produce a nice and interesting arrangement in the front entry hall. One of the visiting family members was coming all the way from Romania and so I wanted this arrangement to be very uniquely Australian. 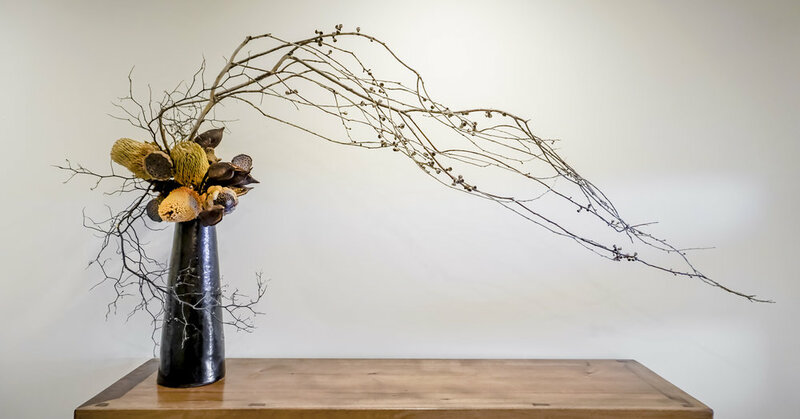 I made use of dried materials including banksia, eucalyptus branches and native seed pods to create the arrangement you see below. Challenging, interesting and very unusual (I thought). I hope you like it. I made a couple of other arrangements to place around the house to make everyone feel welcome. After everyone had had an enjoyable stay and bid us farewell it was time for a brief rest before heading off to Sydney for a seminar and workshop by a visiting Master from Japan! (more about that in the next plog post).